On Tuesday 17th July 2018 at Chesham & Ley Hill Golf Course the annual titanic struggle took place between opposing teams from the Rotary Club of Chesham in what is referred to a ’Texas Scramble’ golfing match. 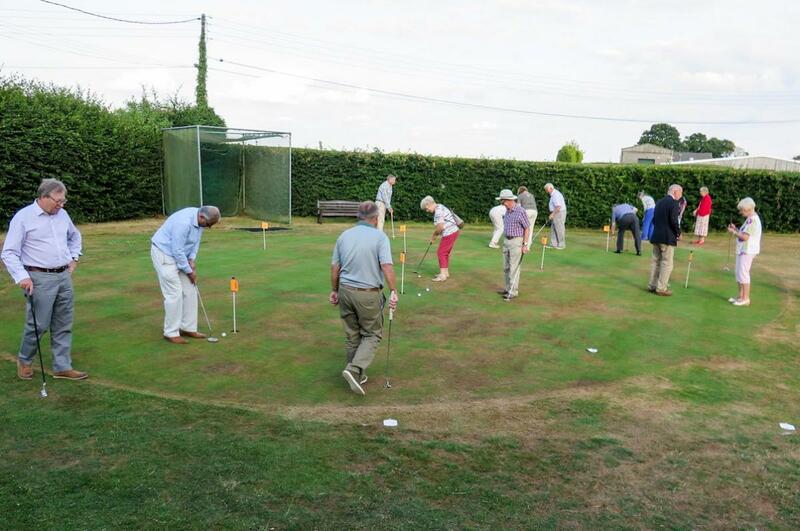 This event, organised by Rotarian Brian Gregory, was followed by a more genteel affair consisting of a putting competition and supper organised and hosted by the ladies of Chesham Inner Wheel club in the clubhouse. The winning team from the Golf Match was Rtn. Bob Ford (Capt); Kalpesh Patel; David Unwin and Andy Garnett. The winning margin was a narrow but the team which came second are not bitter and hope the winners enjoy the wine they so richly deserve. The ladies putting competition was a three way tie with Dorothy Gregory, Eileen Way and Pat Reading having equal scores. The toss of a coin decided that Pat Reading should carry off the prize. All agreed this was a worthy winner. President Kalpesh Patel took the men’s award for putting. Photos are of the evening putting competition. Speech of Inner Wheel President Margaret Gordon. The Winning golf team. Rtns. Kalpesh Patel; Bob Ford; Andy Garnett and David Unwin. The winners of the putting competition: from L to R- Dorothy Gregory; Rotary President Kalpesh Patel; Inner Wheel President Margaret Gordon (with trophy); Pat Reading and Eileen Way.